Today I thought I’d give Book Beginnings a go in addition to The Friday 56. You can find more Book Beginnings at Rose City Reader, and you can find more of The Friday 56 over at Freda’s Voice. Nothing ever really happens. Or, more accurately, nothing new ever really happens. I love the simplicity and stark concreteness of the beginning of this book. It’s no secret that A. S. King is one of my favorite authors, not only because she writes amazing books, but also because she takes the time to engage when my students ask her questions. For kids who live in a small border town and don’t have a lot of experience with authors, answering questions on Instagram makes a huge difference. I want to read this one. Sounds really good! Happy weekend! I haven’t read anything by A. S. King that I haven’t liked, so I’d say, if you’re interested, start anywhere. Happy reading, and happy weekend to you as well. If you like surrealist fiction or magical realism, you might like her. 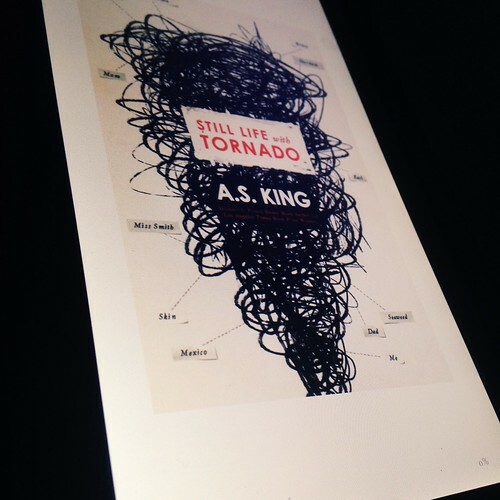 I have yet to read an A.S.King book which is shocking to me because I hear so many great things! You have introduced me to a new author. Will look her up! Awesome! Let me know what you think. Happy reading!